2) First things first, Ensure CLR Integration is enabled at instance level. UNSAFE: unrestricted access to resources, both within and outside SQL Server. Code executing from within an UNSAFE assembly can also call unmanaged code. If you are using assemblies with External access and Unsafe the database property TRUSTWORTHY needs to be turned on. Based on MS documentation this is a quick way to create a copy of database (only Schema) including statistics and Indexes of source database this was released in SQL 14 service pack 2. When this command is issued SQL Server creates an internal snapshot of source database just like how it creates for checkdb and drops this snapshot when the cloning process is done but during the cloning process it holds a shared lock on source database and X lock on target database and it leaves target database in read only mode although you can change the state of the target database if you intent to add data or modify. So why do you need to clone database. According to MS “DBCC CLONEDATABASE should be used to create a schema and statistics only copy of a production database in order to investigate query performance issues.”. The original intention of the feature is to diagnose any performance issues of a production database with out needing to effect the production database. Although this is so late in the game its never to late for new feature. Don’t confuse with Database Snapshots that’s totally different concept. Bottom line: Saves a lot of time when you are debugging execution plans and performance related issues. My colleague reported to me that one of our database server is reporting consistent high CPU usage so I looked at it I noticed CPU was at 100% from last one week when I contacted the application owner and I foundthat they implemented a new feature that polls the database for every second to ensure the data collection process is running properly as it was necessary to ensure that we are under compliance in terms of reporting and auditing. So I ran a query to pull the queries with high cpu utilization with execution count. I certainly noticed a query running more often with high cpu usage. Table is clustered and col1 is not part of clustered index and does not have an index. simple enough SQL server decides to do Clustered index scan and sorts(fully blocking) col1 and selects 1 row with no predicate SQL server doesn’t think its missing an index. CPU time = 2296 ms, elapsed time = 658 ms.
Its very important to understand no matter how much physical resources you might have on a server its very important understand that one bad query can literally bring the server down to it knees. Doesn’t look into the actual pages. Scans a sample of leaf pages (10 % approximately) it may randomly these pages. Does what limited mode normally do but scans every page in the index including the intermediate and root pages. Detailed mode is more accurate than any other mode because it scans every page of the index but this might create some performance bottle neck. It depends on where each of this mode can be used if an index with high fanout (index key length) which is directly proportional to the number of levels , it makes sense to check the fragmentation at intermediate levels using detailed mode at least once a week as part of Index Maint plan. Out of Order pages : An out-of-order page is a page for which the next physical page allocated to the index is not the page pointed to by the next-page pointer in the current leaf page. Out-of-order extent: An out-of-order extent is one for which the extent that contains the current page for a heap is not physically the next extent after the extent that contains the previous page. I was trying out new R feature in SQL 2016 and encountered this error so I thought I would document this issue. View the contents of rlauncher and check the working directory which is where we are having issues creating temp dir. 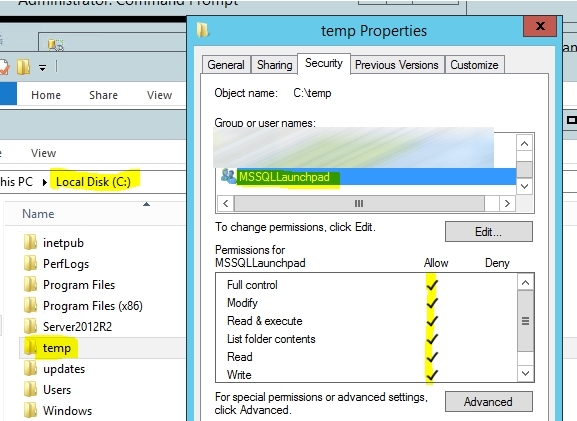 Restart the SQL server services and SQL Launch pad services.